Your holiday gift makes a world of difference to the children and families we serve year-round. When you make an online donation, your tax-deductible gift will be immediately put to work so we can continue training and retaining the best and brightest medical personnel, pursue innovative treatment and research and provide the very highest level of care to children. 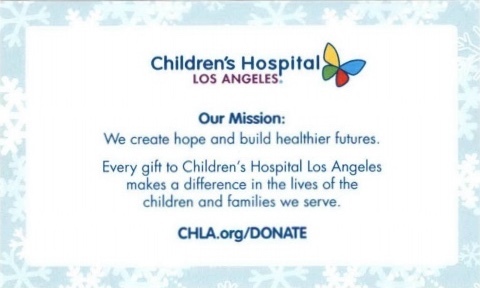 This holiday season, honor your family and friends by making a gift to Children's Hospital Los Angeles. For a suggested minimum donation of $25, we will send you five (5" x 3") standard holiday insert cards which you enclose with your own holiday cards, letting others know of your kindness. 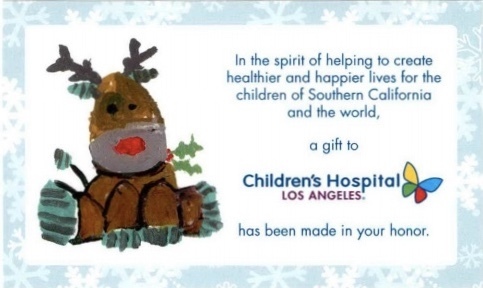 Please call Donor Services at 323-361-3850 to order holiday insert cards. The hospital delivers toys to lift the spirits of patients. This joy is made possible through individual donations and community toy drives. Call 323-361-2371 to schedule a time to deliver your donation, or to coordinate a toy drive. There are many ways to donate toys; please find out more on our Toy Donation page. Members of the social work staff consistently identify families of patients in need during the holidays. These families often have chronically ill or injured children receiving care at Children's Hospital Los Angeles. To sponsor holiday gifts for one of these families, please visit Holidays from the Heart. As the winter holidays focus on gift-purchasing activities and fun with family and friends, the blood banks become very low at Children's Hospital. A blood transfusion or platelet donation can save a life and make a significant contribution to patients this holiday season. Make an appointment to donate blood. Call our Donor Services department at 323-361-3850 to make a gift over the phone.